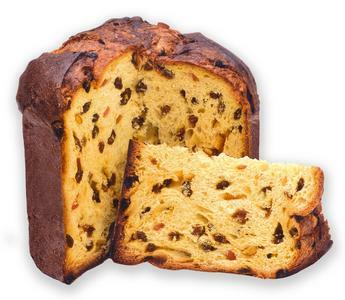 Panettone: Panettone is a type of sweet bread loaf originally from Milan. Panettone usually prepared and enjoyed for Christmas and New Year in Italy, southeastern France, Spain, Portugal, Brazil, Peru, Malta, Germany and Switzerland, and is one of the symbols of the city of Milan. In South America, especially in Peru, Brazil, Argentina, Uruguay, Venezuela, Colombia, Bolivia, and Chile, it is a Christmas dinner staple. Whisk the warm water with the corn flour and caster sugar. Beat in the egg yolks and yeast. Stir in the vanilla extract, orange extracts and glycerine to the batter. In a bowl over hot water (double boiler), melt the white chocolate with butter. Whisk the melted chocolate-butter mixture into the dough. Add in the flour and salt to the mixture. Mix well to form soft dough, using a wooden spoon or rubber. Stir in the chocolate chips, glacé fruit or raisins so they are evenly distributed through the dough mix. Leave the dough mix for an hour to rise. Line the base and sides of a deep, round 20cm cake tin with an over-sized piece of nonstick paper that extends out at the top by 5cm. Scoop out the dough mix and transfer it to the cake tin. Cover and leave to rise for two to three hours, or until more than doubled in height. Pre-heat the oven to 180C (160C fan-assisted)/350F/gas mark 4. Arrange the shelves of the oven so the tall tin and its paper crown have plenty of room to fit comfortably inside. Mix together the ingredients for the sugar crust in a bowl. Dab the sugar crust mixture all over the top of the panettone with a spoon. Dot with almonds and cut a cross in the middle with a sharp knife. Remove the panettone from the oven. Let the panettone cool for 10 minutes. Panettone is ready to be served.